The Dynamics 365 for Field Service schedule board provides an overview of resource availability and bookings you can make. Before you use the schedule board, it is important to set up the views and filters to your preference. To use the schedule board booking functionality, geocoding, and location services, you need to turn on maps. From the main menu, click Resource Scheduling > Administration. Open the record and scroll down to the Resource Scheduling Optimization section. On the Connect to Maps field, choose Yes. Accept the terms and save the record. To view the schedule, from the main menu, click Resources Scheduling > Schedule Board. When you hover over a booking using your mouse, you'll see additional information about it. The line color indicates the type of booking, such as work order, case, or opportunity. Bookings that are not linked to an entity don’t have a color associated with them. When you’re looking at the schedule board for the current day, you’ll see a blue line which indicates the current time of day. You can also see a picture of all the resources listed on the schedule board. To quickly view contact information for a resource, hover over their name to view the contact card. Map view shows the location of resources, organizational units, bookings, and requirements. The screenshot below shows the color legend. From the main menu, click Resource Scheduling > Schedule Board. Filter & Map View: Click the Filter tab to filter information by Characteristics - Rating Roles, Territories, Organizational Units, Resource Types, Teams, and Business Units to narrow or expand the schedule board view. Service Territory filters will narrow down the schedule board to only those resources who belong to that territory. Resource Types, when selected, will show up in the Schedule Board pane by associated category. Categories are defined by the user, but could include things like crew, technician, or plumber. Teams filters by teams that have been set up. 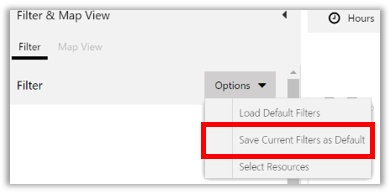 If you update a filter and want to save it as your new default filter, click Options > Save Current Filters as Default. To go back to your default filter, click Options > Load Default Filters. You can also create an option to see only a specific set of resources on the schedule board. For example, a dispatcher using Field Service can create an option to only see resources on the schedule board that are in the Washington territory. Once this is set, when you use the filter option it will only show your specified set of resources. Click Options > Select Resources. In the Resources dialog box, use the Resource Type and Service Territory filter to find the set of resources that you want to see on the schedule board. When you see the resources that you want to work with under All Resources, click Move all to right. Configuration tabs let you choose the time unit to be displayed, the view orientation, the time offset, and other actions like getting driving directions, moving bookings to the next day, printing the schedule, or add a booking alert. To configure the schedule board's time horizon to see hours, days, weeks, months, or years at a time, click the Hours button, and then choose an option. By default, the schedule board is presented in horizontal view, with the time in columns and resources in rows. To see a vertical layout of the schedule board, click Vertical View. The vertical view shows the same information, but changes the appearance of the schedule board. The resources are presented in columns and time is shown on the left. Select the Map View option to show a map version of the schedule board. This is the same map view that appears in the Filter & Map view pane on the left. Scheduler settings let you configure your time offset so you can synchronize dates and content with a location. Time Zone: Choose what time zone to work in. Working Time: Choose the start and end time of your working hours. Time Resolution: Set the time by sliding the bar left or right; this lets you schedule resources in more precise time intervals. Resources per page: Set up the number of resources to be displayed on the screen. The schedule board's appearance will change to show only the number of days selected. Number of Days: Set up the number of days to be displayed on the screen. The schedule board's appearance will change to show only the number of days selected. 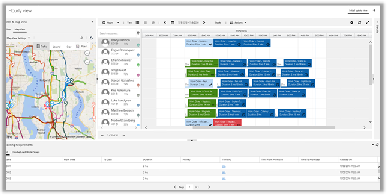 Sizes: Lets you adjust the size of the columns and rows on the schedule board. You can slide the bars to set the ideal height and width that will show all necessary information on the scheduled booking, rather than having some of it cut off. Travel Duration Settings: Lets you see travel time on the schedule board. To activate this setting, select the Show Travel Time check box. View Settings: Lets you hide canceled bookings, deactivated bookings, and hide the legend on the map. Booking Requirements Settings: This filter shows only booking requirements for a specified territory. Click Details on the right to see a detailed view of bookings. The booking requirements area is shown at the bottom of the schedule board and lists all unscheduled bookings. You can easily drag and drop unscheduled bookings from the list onto the schedule board. Go to the list of existing unscheduled booking requirements in the lower pane of the schedule board. Click column headings to sort data from least to greatest, or to sort it alphabetically, etc. Adjust column width by dragging column boundaries on each column title. Expand or collapse unscheduled bookings panel by clicking the down arrow in the upper right corner of the list view pane. To access information on more unscheduled bookings, use the lower navigation arrow to move to the next page. To add a new schedule board tab, click +Add Tab at the top. 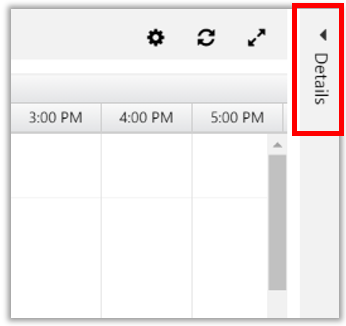 To edit an existing schedule board view, double-click the view name. A window opens showing all the configuration options. Give the tab a name by filling in the Name field. You can configure a tab in a several ways by choosing parameters in each of the configuration options shown in the pop-up window. Click the General Settings, and then choose settings for the map as well as other settings. Click the Schedule Types option, and then choose booking tooltips, template views, and default availability view for each entity type that has scheduling turned on. Click Add at the bottom of the pop-up window to create the new tab. Click the Unscheduled Panels view, and then choose a view from the drop-down list. Choose a view for the unscheduled bookings at the bottom of the schedule board. You can create booking requirement tabs for different types of bookings. For example, you can create separate tabs for work orders, cases, and opportunities. Before you create tabs, make sure the entity is enabled for scheduling. On the schedule board, double-click Initial public view. Scroll down to the Requirement section to add additional tabs. Field Service and Project Service Automation have key functions that rely on location. For example, the location of Service Accounts (which define where services or tasks take place) or the starting/ending location of Resources (people performing services or tasks). In order for the system to show these on a map - or to calculate distances between points - it's necessary to use a mapping service (in this case Bing Maps). Address (account or resource) Latitude and longitude of the address (location) This is referred to as "geo-coding" of an address. Set of locations (latitude/longitude) Distance between locations This can be used to find optimal routes for resources or to calculate travel times. Set of locations (latitude/longitude) Map view with the locations as pins on the map This is used to view the accounts and resources in a map view. Aside from the data referenced above, no other data is sent to the Bing Maps service.